"For the Benefit o the Warld"
Panama, offeecially the Republic o Panama is the soothrenmaist kintra in Central Americae an in turn North Americae. Situatit on the isthmus connectin North an Sooth Americae, it is bordered bi Costa Rica tae the wast, Colombie tae the sootheast, the Caribbean tae the north an the Paceefic Ocean tae the sooth. The caipital is Panama Ceety. Panama wis inhabitit bi indigenous tribes afore Spaingie colonists arrived in the 16t century. 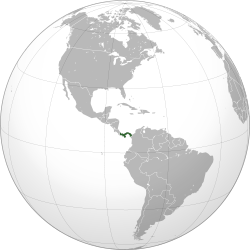 It brak awey frae Spain in 1821 an jynt the Republic o Gran Colombia, a union o Nueva Granada, Ecuador, an Venezuela. Efter Gran Colombia dissolved in 1831, Panama an Nueva Granada eventually becam the Republic o Colombie. Wi the backing o the Unitit States, Panama secedit frae Colombie in 1903, allouin the construction o the Panama Canaul tae be completit bi the US Army Corps of Engineers atween 1904 an 1914. The 1977 Torrijos–Carter Treaties led tae the transfer o the Canaul frae the Unitit States tae Panama on 31 December 1999. Revenue frae canaul towes conteenas tae represent a signeeficant portion o Panama's GDP, awtho commerce, bankin, an tourism are major an growin sectors. In 2015 Panama rankit 60t in the warld in terms o the Human Development Index. Syne 2010, Panama haes been the seicont-maist competitive economy in Laitin Americae, accordin tae the Warld Economic Forum's Global Competitiveness Index. Kiverin aroond 40 percent o its laund aurie, Panama's jungles are hame tae an abundance o tropical plants an ainimals – some o them foond nawhaur ense on the planet. Panama is a foondin member o the Unitit Nations an ither internaitional organisations sic as OAS, LAIA, G77, WHO an NAM. ↑ "Panama". CIA World Factbook. ↑ "Datos generales e históricos de la República de Panamá" (PDF) (in Spaingie). INEC. Retrieved 22 December 2015. ↑ File POP/1-1: Total population (both sexes combined) by major area, region and country, annually for 1950–2100 (thousands). World Population Prospects: The 2015 Revision (Report). United Nations, Department of Economic and Social Affairs, Population Division. April 2016. Retrieved 17 December 2015. ↑ Distribución territorial y migración interna en Panamá: Censo 2010 (PDF) (Report) (in Spaingie). INEC. 2014. p. 2. Retrieved 22 December 2015. ↑ 5.0 5.1 5.2 5.3 "World Economic Outlook Database: Panama". International Monetary Fund. October 2014. Retrieved 3 January 2015. ↑ "Gini Index". World Bank. Retrieved January 3, 2015. ↑ "Panama". CIA – The World Factbook. Retrieved December 23, 2010. ↑ UNDP Human Development Report 2015. Table 1: Human development index 2015 and its components (PDF). UNDP. p. 144. Retrieved November 6, 2010. ↑ "Country profile: Panama". BBC News. June 30, 2010. Wikimedia Commons haes media relatit tae Panama. This page wis last eeditit on 28 Dizember 2018, at 18:57.